9 ft. Outdoor Patio Market Umbrella $45! thanks to bradsdeals.com for this post! mojomilk.com offers Free Sample of Mojo Milk for Free. If you are planning to visit Hershey Park this season, purchase your tickets online and apply a Hershey Park Coupon Code. Valid on Adult One Day Admission Tickets, online only. Planning to spruce up with paint? Get $5.00 off manufacturer mail in rebate with each gallon size can or get a $20.00 off manufacturer mail in rebate with each 5 gallon size can of paints. Participating paints include Behr, Martha Stewart Living, Glidden, and more. Offer is valid on paints purchased between 5/19/11-5/30/11. thanks to Forthemommas.com for this deal! Get 70% savings with the code PLATE ...click on icon above. Don't forget to join RubyTuesdayRestaraunt.com! We had a nice night out tonight and our $10 off two entrées helped out! I receive coupons like this on occasion thanks to the email club. 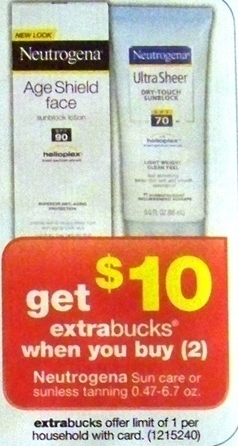 Hurry to coupons.com and print this $1/1 Coppertone Sunscreen coupon twice! These coupons have not been lasting long this month on Coupons.com. There is a hot Rite Aid deal on Coppertone starting Sunday, 5/22! Dining Out? Olive Garden is offering a $4 off any two entrees coupon via Facebook. Simply "Like" them and click the "Coupon" tab. FREE stuff you'll be able to snag! marked boxes to get the $5 visa card! Head over to request a FREE 1-Week Supply of Nature's Bounty Fish Oil! Allow 8-10 weeks for delivery. 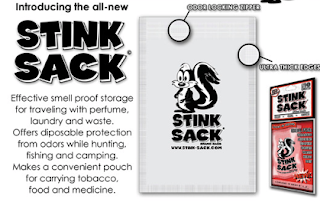 Go here to get a FREE Stink Sack! It’s an odor-proof, resealable bag, with limitless uses! Just enter in promo code FB211 or FB511. You can also see what others (that have received their bags) think about it here on the Stink Sack Facebook page. Head over to Old Navy this Saturday, 5/21 for $1 Solid Flip-Flops and a FREE treat from Fruity and Cocoa Pebbles! Doors open at 7 am. 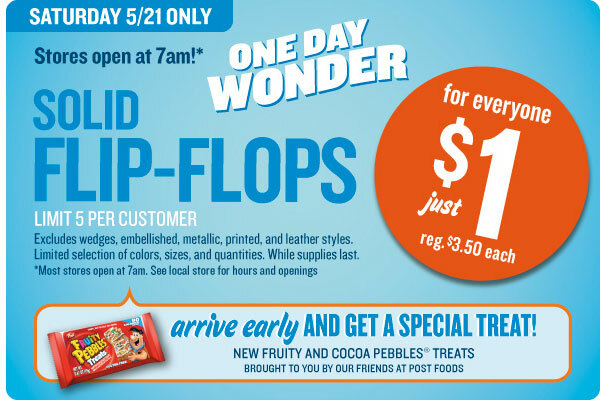 There is a limit of 5 Flip-Flops for $1 per customer. You can save $5 on a purchase of $35 or more when you print THIS COUPON! 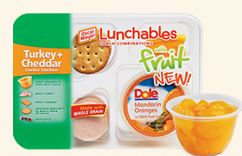 Some Target stores have Lunchables With Fruit priced at $1.35. Use the $1/1 coupon to get them for just $0.35 each! 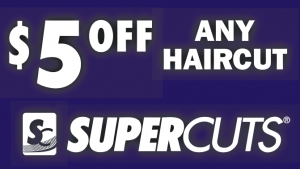 If you have a Supercuts nearby, you can rack up the savings on haircuts with this printable coupon for $5 off Haircuts! The coupon states one per customer, so each person in your family can use it! You might want to call ahead to confirm, as the coupon states "participating locations". Head to Tanga.com for these prices. 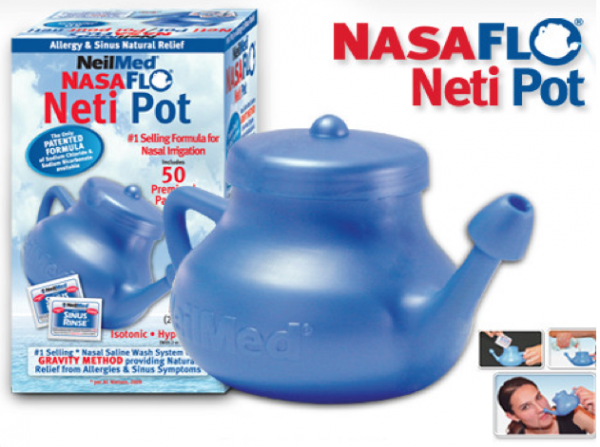 NeilMed NasaFlo Neti Pot with two packets. If you’ve not requested your free NeilMed Neti Pot yet, you can click on the “Like” button on NeilMed Facebook Page to sign up for a free NeilMed NasaFlo Neti Pot with two packets. AND THEN, tell us all about your experiences at trying to use it! Sometimes worth a good laugh! Thanks to For the Mommas for these match ups! Here are the best deals for CVS week of 5/22. Check back Saturday for the full list. buy 2 and use (2) $1 off Irish Spring Body Wash, Bar Soap or Deodorant CVS Coupon from the Reinventing Beauty Magazine found in the store. FREE CVS GAS CARD w/$30 Purchase at CVS/pharmacy for $30. With summer around the corner and gas prices reaching $4 per-gallon nationally, CVS/pharmacy has announced a new program designed to allow customers to earn free gas all summer just by shopping for essentials at more than 7,200 locations nationwide. From May 22 – August 28, 2011, members of CVS/pharmacy’s ExtraCare Rewards program can earn one $10 gift card to Exxon/Mobil, Shell, BP Amoco or BP Arco every week simply by spending $30 on specially-marked items found conveniently in the weekly CVS/pharmacy circular. Arby's Coupon for this weekend! 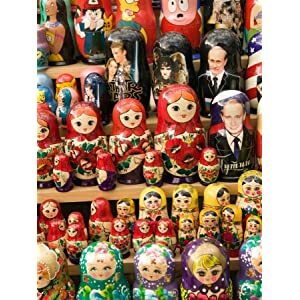 Artichokes, parades, and Matryoshka...or being the littlest nesting doll. No surprise, really. When we go anywhere we arrive as our own parade. Six of us in a line, two driving power chairs. Not just any two, though. A matched set, a pair, identical twins. I understand it, really. Either one of those situations causes people to take another look so the combination adds up to an extra looong look to process it. And it can be interesting how people process our family. I don't generally take notice anymore as it is just a part of our comings and goings. But this time it was hard to overlook. As we headed into the grocery store to hit up their hot and cold foods bar for lunch we passed another mixed generational group chatting on their way out. The eldest gasped and directed the group to look at the twins exclaiming how lucky they all were. Not the twins, the rest of the people in her group. She was lucky, too, she acknowledged, and asked several to agree with her over their luckiness. In that moment I was feeling that we were stamped "unlucky". If there is anything great about passing 40 years old, it is that I am older. Seems like an obvious statement, but it works for me. I am older and no longer feel like a quiet spectator on the side lines of the real world. I am in it, just not of it, so I spoke up. Apparently I got my driving license at 16 and my speaking up license at 40. Who knew. I simply said "I feel lucky, too." It did startle her a moment. I am not sure what surprised her, that I could hear her conversation taking place next to my ear, or that I was declaring us members of her lucky club. She recovered and assured me it was good that I felt that way. I ended it there and continued our parade. OK, OK, I almost ended it. The rest of my thoughts were muttered into Brielle's ear. Sorry, dearest. It took me a moment to shake it off and I ended up with quite a combination of foods touching each other on my plate. Tuna salad, pickled red beat eggs, warm mac and cheese, fried chicken, and artichokes with olives. Did I mention they were touching? Yikes. Fantastic Cold Water Creek Coupon code! Through 5/25, ColdwaterCreek.com takes 30% off with code NZN6016. This code works on Outlet items as well. The code also give you free standard shipping on your order~ WOW! DicksSportingGoods.com takes $10 off the price of this Quest 100 Level Volleyball Set, dropping it to $29.99. At checkout enter code AFL7982, which cuts it to $25.49. After adding $8.49 for shipping this is the best price we could find on any volleyball kit by $10. With summer just about here this is a solid set to set up on the nearest beach and play. It includes an adjustable white PVC pole, scoring system, mesh net, ball, and pieces to hold it in place. Most states charge sales tax. 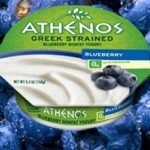 Click on the “Like” button on the Athenos Facebook Page to print a Buy One, Get One Free Athenos Yogurt coupon. southwest.com offers Southwest Airlines Flights From $49 And Up, Big List for $49+. proairhfa.com offers Receive a free inhaler pouch. for Free. mintystrips.com offers Free Sample | Minty Strips for Free. Old Country Buffet is offering a FREE buffet when you buy one! Just Like them on Facebook to get your coupon! Thanks, Frugal Living and Having Fun! You can combine these coupons with manufacturers coupons and score some great deals! GO HERE to see the deals for the week. 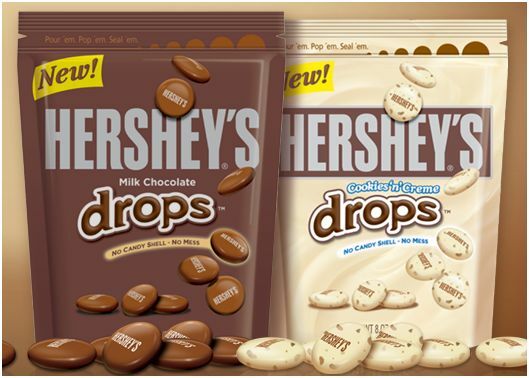 You may be able to get FREE Hershey's Drops at CVS this week! Scan your card at the price scanner and look for a $2/1 Hershey's Drops coupon. Combine that coupon with a manufacturer's coupon for a sweet deal -OR- save your coupon and go back tomorrow. If you get the coupon again, you'll get two bags FREE! You can pick them both up for $.50. See more Giant Deals here. You can get a free rental today only at Blockbuster Express using code MONDAYFUN. Valid May 16h , 2011 only. New Coupons to be printed! Don't forget to check out Coupons.com and Redplum.com for some great new printable coupons! 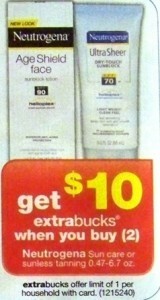 Well I was excited for the sunscreen deal at CVS this week and just wanted to update you with what I found. Sadly, the cheapest sunscreen at my store was the sticks at $9.29. They had regular sunscreen for $10. So $3 each which is a good deal. 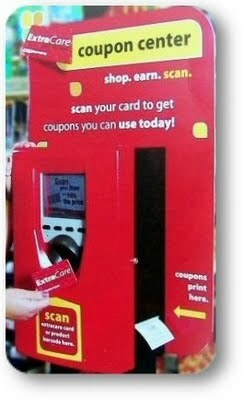 This week, there is a $3 off $10 healthcare purchase coupon printing at the coupon scanner. There is a good chance you can use the healthcare items coupon on your sunscreen purchase, which makes the final price $1.50 each. That is an excellent price. See the complete list of CVS deals for the week here. 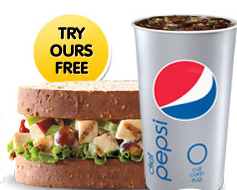 for coupon of $1 off 2 20 ounce coke products! Lumber Liquidators and AMF are offering two free games of bowling! Answer a question about either the PBA or Lumber Liquidators and win two free games of bowling with your right answer! 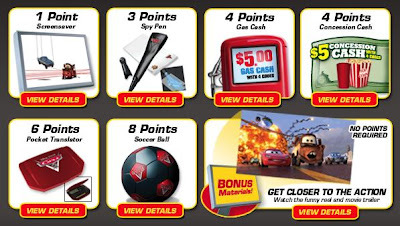 Free games available only while coupons last-HURRY! Valid until August 31 at participating AMF bowling locations (find a participating location near you by visiting http://www.gobowling.com/). Text DEALS to 727272 every day thru May 25th for a new discount code to use at the kiosk that day (between $.10 and $1.50)! Staples will have Scotch tape for $0.99, making it FREE with this $1 off coupon this week. Walgreens has Scotch tape on sale Buy 1 for $1.99 get 2 Free with the in-ad coupon. Use 2 of the $1 off coupons to get 3 rolls FREE! Target just released a $2 off 2 Ore-Ida Frozen Potato Items Target coupon. Many Targets have Ore-Ida Easy Fries Golden Crinkles for $0.99, so you can get 2 packages FREE after coupon! Target.com just released apparel coupons for $2/1 ANY Womens Top and $3/1 Mossimo Women’s apparel item. Many people are reporting finding clothing items on clearance for as low as $1.98, so FREE after coupons! Print these now because they tend to disappear fast! BestBuy.com bundles Dance Central With Microsoft Kinect for $128.99. This is the lowest price we could find for the bundle by $34. The Kinect is the fastest-selling consumer electronics device ever because it lets you control the actions on your XBox360 by your movements. The bundle also includes the Kinect Adventures game. In-store pickup is free; otherwise shipping adds $5.49. Sales tax is charged in most states. my girls LOVE playing games with the Wii. Would they enjoy this?